Rosie’s on Robson (website, menu, map, 298 Robson Street, Vancouver, BC, Canada, phone: 604-689-4499) is a casual British pub -style restaurant located in the heart of downtown Vancouver’s entertainment district. The establishment offers reasonably-priced, hearty North American and British fare. House favorites include the Shepherd’s Pie, stuffed Yorkshire Pudding, fish and chips, and chicken pot pie. 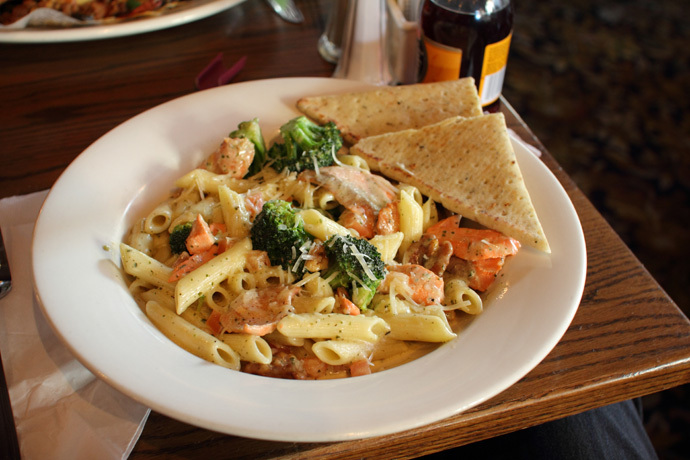 For health-conscious Vancouverites looking for something a little lighter and “west coast”, Rosie’s also features delicious items such as the Thai Chicken Salad, Veggie or Salmon burger, and the chicken and mushroom penne. At lunch time, most entrees are in the $10 to $14 range which is quite reasonable considering the restaurant’s convenient location and proximity to venues such as Rogers Arena, BC Place Stadium, the Queen Elizabeth Theatre and the Centre for Performing Arts. A 10 minute walk up Robson Street will bring you past the local library (book lovers unite!) to Vancouver’s famed upscale shopping district with the likes of Tommy Hilfiger, Le Chateau, and lululemon. I ordered the Salmon Pesto Penne ($15, pictured below) which was served with diced tomatoes, broccoli, and walnuts in a pesto parmesan sauce. It tasted as good as it looked! Stepping into Rosie’s and experiencing the comfort food and decor of a British Pub is a refreshing change from the mostly-similar and ultra-modern trendy places which seem to be popping up these days. Don’t expect to be wowed by super-slick staff sporting the latest in cosmetic enhancements – instead you’ll enjoy a down-to-earth dine on delicious and honestly good victuals. 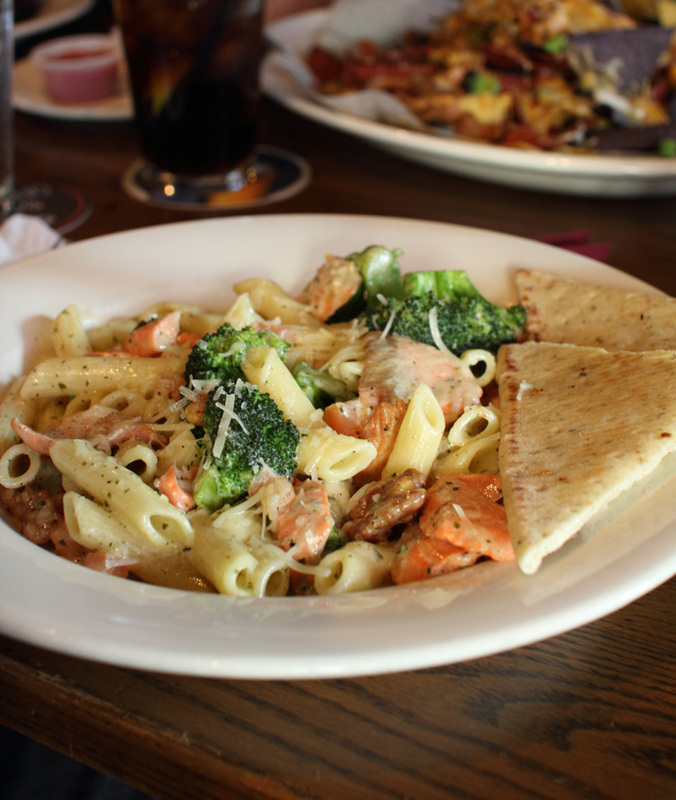 Salmon pesto penne pasta from Rosie's on Robson, restaurant in downtown Vancouver BC Canada. The Naam (web site, 2724 W. 4th Ave. Vancouver BC Canada, phone: 604-738-7151) is a full service vegetarian restaurant that is open 24 hours and is popular for inventive organic and natural foods dishes. The Naam has won the “Best Vegetarian Restaurant” award for the last ten years in the Georgia Straight Magazine’s Golden Plate Awards (Reader’s Choice). The Naam serves breakfast from 6am until 11:30 am on weekdays (and until 1:00pm on Saturday and 2:00pm on Sunday). 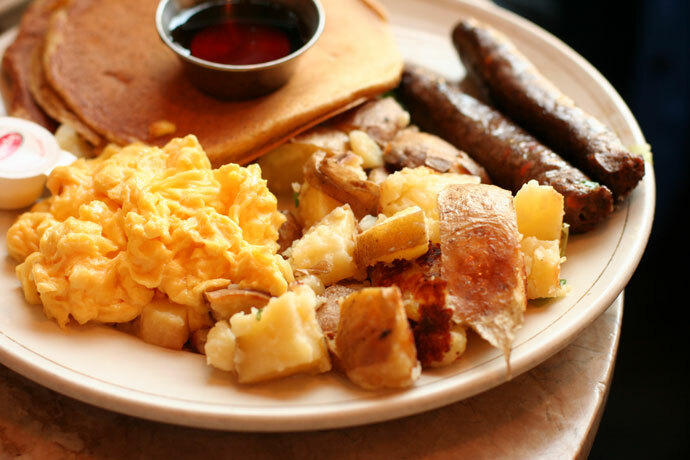 I enjoyed the “Naam Special Breakfast” (pictured below, $9.50) which is two eggs any style, two whole wheat pancakes, veggie sausages or “Sam’s strips” (a kind of veggie patty) and home made potato fries. Yum! For lunch and dinner, the restaurant serves tasty creations such as enchiladas, burritos, burger platters, curry, rice bowls, and wok dishes. The Naam also features live music (mostly folk, jazz, and blues) from 7pm to 10pm every evening. Check out their web site for the upcoming schedule. 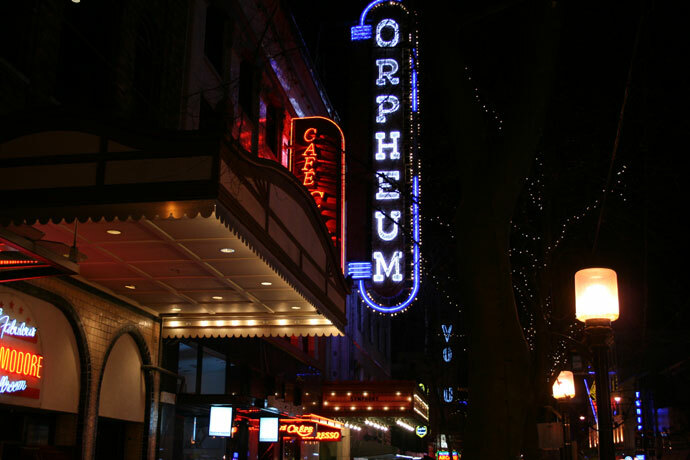 The Orpheum Theatre (web site, address: 884 Granville St., Vancouver, BC – main entrance at Smithe and Seymour) is a concert hall in the heart of Vancouver’s downtown Granville Street entertainment district (pictured below). It is the home of the Vancouver Symphony Orchestra. View More Restaurants in the Concerts category. We hope you enjoy the great Concerts restaurants on Dine Out Here Vancouver.